Sweet Cadence came to ABR last month with Burt Nelson and quickly found a great foster home. She was already quite old when she came into our care, but we had no idea how soon we would lose this beautiful lady. 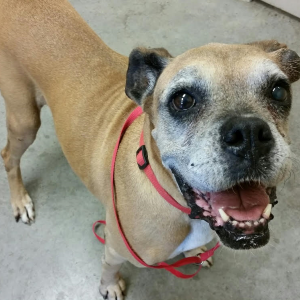 This gentle, calm girl had the most wonderful smile and was such a happy boxer despite her circumstances. She settled quickly into her foster home establishing that she could get along with any dog, even her bossy foster sister. Although her foster home was not supposed to be her forever home, she did find a forever place in the hearts of her foster family. After only a week in her foster home Cadence took her place among the angels. 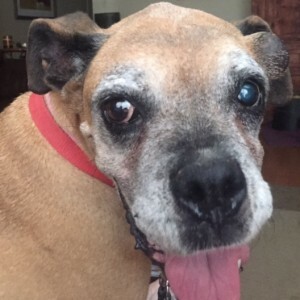 It’s always so sad when we lose one of our precious boxers, but even sadder still when we don’t have enough time with them to make up for the things they lacked in their former lives. Luckily, Cadence knew pure love in her foster home, she knew what it felt like to have a full belly, she knew what it felt like to sleep the sleep of a dog who knows she’s safe, and she knew the glorious taste of cheese. Cadence was in a home with people who saw only the perfection of her beautiful soul, and not the deterioration of her aging body. In rescue we know we can’t save every dog, and sometimes we just don’t save them soon enough, but sometimes we can accept that our job is to love them the best we can for the time they have left, even if that is only one week, or one day, or one hour. Cadence was loved, and she was wrapped in the arms of love as she breathed her last and left this world behind to join the many pure souls of furry family that have gone before her, and she will remain forever in the memories and hearts of those who loved her.